Commenting on other blogs is one of the effective methods to get backlinks and getting links from a do follow blog automatically increases your site visibility in search engines and also your page rank. You can comment on hundreds of blogs on the internet, but only a few of them are really dofollow. 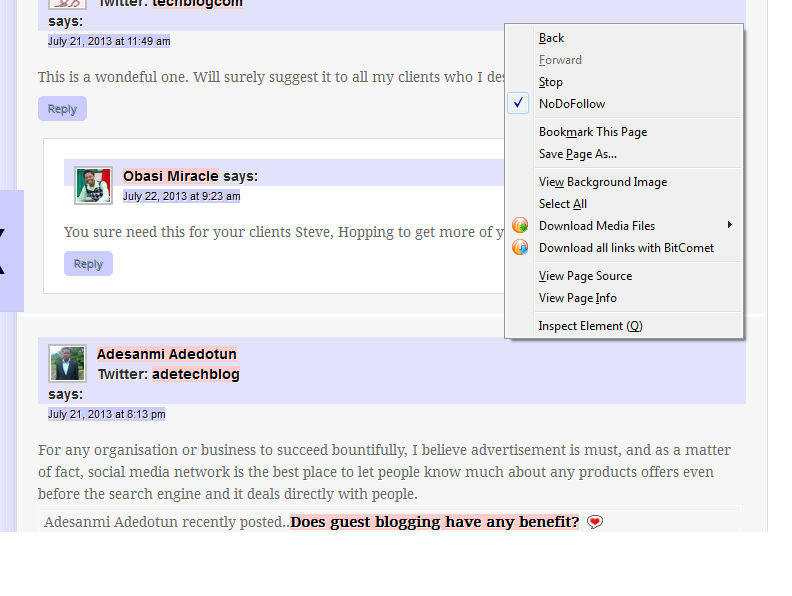 To check whether links from a blog is dofollow or not there are two tools you can add to your browser to do so. After installation of this plugin, you can quickly get access to full details of any website or blog that you open in your Google Chrome Browser. Your Keywords ” Notify me of follow up comments? “Submit the word you see below” or simply copy and paste it from here. Please make sure you leave the quotes, they are important. change the site:gov to site:edu to find .edu sites. Remember, when searching make sure the quotation marks(” “) are not removed. I sometimes ignore the “no follow” and “do follow” thing while commenting on other blogs because a Nofollow link from a good domain will get you good traffic and also improve your page rank. Commentluv blogs are personal, business or professional blogs that have the commentluv plugin installed and active on their website. Commentluv plugin on its own is a tool that encourages readers to leave a comment on your blog by offering them two links to their website and another link to their Twitter profile. While the first link goes to their blog’s homepage, the second one is for any of their ten latest blog posts. The plugin is popular among influencers, freelancers, and digital marketers. This is the easiest part as it’s something you can do in a few seconds: Simply do a search engine query with this keyword; “This blog uses commentLuv.” Wait for the result to show and then pick the blogs that are related to your niche for commenting. I like your blog site. Thanks for sharing these tips. Wow, nice tips here to find Dofollow blogs to comment on. Like you already mentioned, dofollow links pointing to your site is great means to improve your blog reputation to search engines and hence increase your search engine ranking! I will sure follow your tips. Thanks for sharing! These are really nice tips to find the do-follow blogs of your niche. ofollow backlinks help your blog visibility in major search engines like Google,yahoo,bing.Here is many method to create high dofollow backlinks but the main and popular way to make dofollow backlink is blog commenting and this is very easy method to make good and unique dofollow backlinks and here is many blogs where we comment many of nofollow and nofollow backlink is ignored by search engines bot. nice and effective post about seo backlink.for the help of the post ,many people/visitor able to create backlink and get more traffic for their sites. thanks a lot for this article. • This article is very amazing, I was very impressed at all. Keep practicing your English and you’ll get better. your blog since long…always a good read.thanks. Thanks for the post. nice post…. We will adjust your website code, structure, content (with your revision and approval), meta-tags, meta-files, some specific html tags, the keyword density and keywords predominance, etc, and other SEO actions for selected keywords. Here you open a right topic those who really in web basket to keep users view and idea. Only idea is core of changes, improvement and growth. However most of comment is positive but some are negative. There are many comment tools but commentluv is good one for me. good post. thanks a lot for this wonderful tip. Thanks for the info! I’m new to SEO and wasn’t even aware of Do follow and No follow blogs. I’ll try to get several of each. And thanks for the firefox add-on I’m sure it will come in handy! These are of no use as they don’t approve the comments :) can you tell us some way to get them approved. Most a times, comments gets disproved because they are short, spammy, isn’t related to the topic of discussion or not in line with the comments guidelines of the host blog or website. It’s important to define your objectives. This is the basis for building your website to make your audience take actions that will help you achieve your objectives. Want them to buy? Set up an ecom store. Want them to leave their contact details? Provide a form for them to fill in. Align your website with your objectives. I also like to use the website, “Drop my link” to find good blogs to leave a comment. Thanks for sharing! Dofollow is very important for backlinks..That’s great to know about the information to find dofollow links in blog..
Today it is very important to work on do follow backlinks. A well planned do follow backlinks strategy can help us in better SEO experience. I have a link to share with you all. goforseo.com/what-is-do-follow-backlinks-dofollow-vs-nofollow-backlinks Read this link to know how important it is to work hard for do follow backlinks. Simply the nice and informative post. That’s great to know about the information to find dofollow links in blog..Dofollow is very important for backlinks.. I also use this on my site to check quick needed things about alexa. Nice one and informative! This will help us in our website’s link building activity. Great ways to find CommentLuv blogs in your niche,also you can direct find the blogs for commentLuv through Drop my Link website. Thank you! I want to say how much I enjoy your blog. For beginners, like me there is so much to reference. For instance if I do not understand DoFollow, I can go find an article and learn about it. I’m getting it. it is very helpful information to me to find do follow blogs. thanks for share it. Do-follow Comments are most highly powerful for Highly qualified ranked, when i read this article i can get more thought form here and gather more knowledge from here. Great information for creating backlink from high authorized websites like .edu and .gov. Thanks Kyle for sharing the fruitful information among us. For all blogger and SEO expert can get easily professional ideas from this blog Because Kyle’s blog is really awesome where only he discussed the effective idea of blogging and Linkbuilding …Really nice. There is too much information on this page, thanks for sharing. I think .gov and .edu are still making difference. Hello I am new to your blog, and seen some post and I feel very good thanks for sharing information to keep learning every day. in fact this is realy useful at least to some extent, will love to see more of this. That’s great to know about the information to find dofollow links in blog. Thanks for sharing. but do follow is not enough backlink has high pr to… I also think .gov and .edu are still making difference. I am feeling very lucky to have viewed this post. Very great information. Keep postings. This article has a lot of unique and quality information. Seriously by reading this article i know the importance of do follow comments , Actually i am new in seo so this article is very helpful for me . Thanks for share with us an important article. thanks i already bookmarked your website. you are amazing writer man. Just love your articles. Thanks for providing information in such a short and clear manner. We have learned very powerful tips from your site. I always follow you websites. Pretty interesting and informative content. Great resource to find do follow back links. Thanks for posting good advice! Appreciate the search instructions. It amazes me how hard these are to find to find certain blogs or sites in your niche. I’m not very tech-savvy so it’s nice to know how to narrow things down when I search for useful sites. Thanks again! Thanks for sharing the awesome extension for my chrome browser. Excellent !! Author really done a good job, this blog is very useful. Thanks for sharing. Thanks, great work on the seo article. nice and really useful for who search for link building. Thanks for this article. Another way is go to Drop My Link. , nice tips here to find Dofollow blogs to comment on. Like you already mentioned, dofollow links pointing to your site is great means to improve your blog reputation to search engines and hence increase your search engine ranking! I will sure follow your tips. Thanks for sharing! I read your post and found it quite unique. The post you shared is very interesting and informative. Thanks for sharing such a useful piece of yours. Nice idea. Me, i used Drop My Link to find relevant blogs. Somehow it helps me a lot. Thanks for share with us an important article. We have learned very powerful tips from your site. I always follow your websites. Thanks for sharing nice article. Really like the point of adding the extension of nodofollow as your firefox extension. I have installed it but i am not able to open that extension, i am working on it. But thank you. This strategy to build quality backlinks is amazing. I am motivated by the image you shown in your post as a proof and after that i try to built backlinks using your technique and guess what ? i am getting good results. Thanks for sharing this article. Keep sharing more articles so that more users can get benefits. very attractive and useful site thanks for sharing! Simply blog comments are two types nofollow blog comment and dofollow blog comments . Dofollow blog comments pass link juice but nofollow link not use by search engine.thanks for sharing us such post. Great post!!! !…..I have a question though…..Commenting only on dofollow blogs might be considered spam. I suggest you also comment on nofollow blogs. Please reply if I am wrong. this is the one of informative post for me i get a lot points from here.. and i suggest for other to create back-link.. Awesome information . Many thanks. so, nice tips here to find Dofollow blogs to comment on. Like you already mentioned, dofollow links pointing to your site is great means to improve your blog reputation to search engines and hence increase your search engine ranking! Dofollow is very important for backlinks..That’s great to know about the information to find dofollow links in blog. i use one of the method you have mentioned in the above post, i also visit top blogs and reach there comments section to find out new blogs for blog commenting. in this way i am commenting on the industry related blog or same niche blog for getting quality links. i read the article and then comment genuinely, i don’t just comment for sake of a backlink for my site. Thanks for sharing this info. I am using DropMyLink to create quality backlinks. Also I wrote an article about it. Thanks for sharing knowledge. This is very amazing. Wawo great writing i read your post and found very helpful thanks for this awesome work..
Blog commenting is one of the easiest way to pick up free dofollow backlinks and it assists to increase the Google page rank. Blog comments is a technique that generate communication between blogger, blogs and blog readers. It’s a best way to share estimations and ideas about huge topics. Blog commenting sites are helpful for affiliate marketers and new bloggers who are looking for more traffic for there blogs. Wonderful information…Thanks for sharing. It will definitely help. Very important information for us who working beginner level, thanks for sharing it. Using google search operators as footprints is still, (even today) an underrated tactic for easy link building. Cheers for the article, it’s given me some nice ideas! Dofollow is very important for backlinks..That’s great to know about the information of dofollow links. please inform me how to find dofollow link. Keyword, i think the word of any post which you published and want to add for public. Great wording it solve the my confusion about keyword. I just want to let you know that I just check out your site and I find it very interesting and informative. I can’t wait to read lots of your posts. Tnks information.. Good jobs…!!! Nofollow link from any web page does not help your site rank, sure if it is on a nice website it might give you some traffic.There are many comment tools but commentluv is good one for me. Nice tips to find Do-follow blogs to comment on. Really Great Piece of article.Link bUilding is the most important fundamental aspects of to rank higher in search engine however also the content is really important for the website to be appeared because content is the King.well keep posting. Cheers. I also love using quotes and images to hook readers in my blog posts. Very useful post. Excellent guidance. I am sharing it with my social circles. Thanks for sharing information. Now i understand the Key words importance in do-follow. Great quote you’ve got on the top of this post. Great Article. Completely agree with the flow. Thanks for sharing. I am sure other too would benefit from it. Cheers…! Your post is soo useful for me, thanks for your important post. Thank for sharing this information.This is a very interesting site you got here. I really enjoyed reading through your article. Awesome. Drop My Link is the best way to find dofollow commentluv blogs and get quality backlinks. Good post ,thank you for sharing. Thanks for sharing this post. Relevant niche is the way to go..
this is really nice article, i am doing seo for my websites and it helped me a lot, thank you buddy, stay blessed. Excellent article for beginners to find their footprints. Thanks for the list. Really loved reading the article. Do-Follow blog is very important for seo linkbuilding. Amazing. I like it. Very good information. You have shared in a very well manner that may make my task easy. I like your explanation on Vinyl. Also the sites mentioned are very handy. Very good article…I was searching for same since few days ago. I really appreciated this article. I was glad that you took the time to specify which “commands” we could use on Google in order to find out what blogs were relevant to comment on. One thing that I found a little confusing at first was that I was not sure which were the parts I was actually supposed to type in to the command line. I mention this because I don’t think I am stupid or a total technological newbie. I would recommend doing a screenshot of a sample search typed into Google. Such an example would really help clarify things and add a lot of value to the article. Also, an explanation of what each part of the “command” does would be nice. I figured it out for myself, but it would have been easier to have it spelled out. Maybe I like being spoon fed :). Nevertheless, the article has valuable information that I had a hard time finding anywhere else, and I really appreciated it! This information is very helpful, This blog gives us very meaningful things.Thank you. This is very informative post. i must read and get help from your post. thank you for posting this. Really Good work n very help ful info.Thanks a lot. It is very informative post which inspires the skills of the person to learn about the seo. Thank You! is there any website who direct us into comentluv blogs? nice post . i really like this post ,. i waiting for your next one . you can also use this to help in this topic. 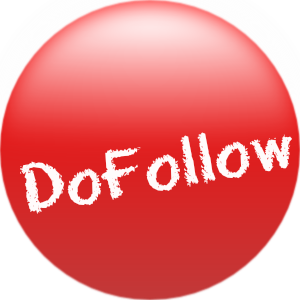 Thanks for sharing this awesome tips for finding do follow blog,i will try this. It’s really interesting post. most of SEO learner learn a lot from this post. thanks for shearing…. Hey! This is so helpful, thank so much. I’m going to try these search queries out. Great Article. Completely agree with the flow. Thanks you! Great Article ! Completely agree with the flow… Thanks for sharing. I am sure other too would benefit from it. Cheers!! Thanks for providing a such good post and really like to read this wonderful article. This article is very helpful to me..
3ptechies is very great website and this is a nice post. This is a helpful content. I always try to follow this site for something learn. Here I have found my needy tips. Thank a lot. Wow ! I really appreciate this blog because of your research or informative information in this blog is too good. You can provide a solution for both browsers it’s so impressive and I really waiting to read your next post in future. Some days ago I have read an article like as this topic. But this article is more helpful for me. Thank you for sharing this helpful information. It will help my small businesses opportunities. This is the basics for building your website to make your audience take actions that will help you achieve your objectives…. it really shows your efforts for the seo…. First of all i want to say that you wrote very informative post and this is really a nice tips to find the do-follow blogs. I agree with you. I will sure follow your tips. Great artical . thanks for sharing use full information about to do follw . and i like this post . I never knew how to find .edu and .gov blogs ! Really Nice Information Thanks For Sharing Very Useful. It is very nice post related to dofollow comment v/s blog. It is very informative to SEO students and professionals. Thanks for uploading such informative blog. It was of great help. Very nice and informative post related to do follow commentluv blogs. In backlinking do follow comment is very important and this post gives the detail information related it. should encourage and appreciate.Informative and interesting thank you for sharing. Hi guy! Your post is so great, please keep going. This blog post is just amazing. It will definitely gonna help the new SEO’s in finding the do follow blogs easily. I am currently doing SEO for the blog “Malware removal tool” and I guess this post will be helping me a lot. Hi, Really Great Post i really like thank you so much to the author you shared with very expert experience!! I also follow this method on my website. Great experience.This blog post on Comments and SEO is very informative and also very interesting.thanks for sharing. In back linking do observe remark may be very vital and this post gives the detail information associated it. Your article could be very informative. Thnx for sharing this tips it will help me to understand which site is good for do back link. I recently had a word with a co-worker and he suggested me to start using AHREFS for link building. would love to hear your views about it. Ahrefs is a lovely SEO tool for link analysis, optimization and etc. I am really inspired from your article. Thanks for sharing with us. Nice info! This is very nice explanation about how to do dofollow comments with niche related sites. Hope it will helps digital marketers to build more backlinks to their website. Great Article.. Completely agree with the flow…Thanks for sharing. I am sure others too would benefit from this SEO content. Great article! It is really helpful for me, i were searching for a method and i finally get the one. Very interesting article here…..specially for new comer bloggers. Great Article.. Completely agree with the flow. Thanks for sharing. 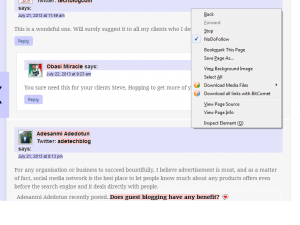 I am sure other bloggers and marketers too would benefit from it. Cheers..!! Do follow comment link is better than nofollow ones. Great information overall. It really increased my knowledge about blog and site commenting. Thanks for the informative SEO post on blog commenting. Nice post. Offers fresh insights on blog commenting. I will try the outlined methods on my link building strategy locating do-follow blogs in my niche. Thank you for your efforts. It is an excellent article for novices like me. Very helpful plugins and search strings for link building campaign. I never knew untill now that no follow link from a goof traffic can brink a pretty good traffic and higher up the rank. Nice article on SEO with everything all explained in details !! it is very helpful to me. Great Article. Completely agree with the flow. Thanks for sharing. I am sure other too would benefit from it.! Cheers!! Super helpful post. Your blog is full interesting and practical methods to improve my link profile on my website. Thanks for sharing. keep it up. Nice tips and tricks shared by you this will surely increase the rating in any search engine and I appreciate your work. And thanks for sharing this. Nice post, These are really nice tips to find the do-follow blogs of your niche. I appreciate your work. Thanks for sharing. Excellent advice, pure gold…You may want to visit this site too! Such a nice and Helpful Article i am happy to reach you and Read your article. i share your article on my social media accounts and also bookmarked because its very helpful for me thanks for publishing this valuable tips. you provide the best resources and i am waiting for your next article. thanks for providing such a valuable information. It will definitely help new bloggers, internet marketers and SEOs. Thanks for sharing this post very helpful . for new bloggers. Arefs is the ultimate tool for link analytics, but guest posting, marketing out-reach and forum participation is the most recommended ways to build backlink for money blogs and/or long-time websites. super-awesome tut on SEO tools. Really awesome post and I got clear many points after reading this post. Please assist me to make my blog fruitful. hey sir this post is really very helpful for me. i want to say that you should publish more article on seo topic.very good post. Great more experience.This blog post on Blog Commenting and SEO is very informative and also very interesting.thanks for sharing it. I also have a website for Seo and affiliate marketing. hey. very nice content on SEO shared by you. this article is very useful for one who works on improving On-site SEO techniques. keep updating these type of tips tutorials. i got many new things from this detailed guide. thanks a lot for sharing your knowledge with us. I really content about finding do follow blogs in the relevant niche. It benefited me a lot. What a great way to find relevant backlinks. thanks for this great job and just keep it going. Blog commenting is the best way to promote your website in SERP but only DoFollow comment. This post is very helpful to find DoFollow commentLuv blogs in your niche. I will suggest posting a unique comment. This is a good resource for finding best SEO tools. I found all the browser plugin SEO tools in this single helpful post. It’s amazing! Thanks again for sharing such an insightful post. This is the best tech ideas for the seo.So your tips is very helpful and make good backlinks for their websites. Commenting in other blogs is one of the effective methods to get backlinks and getting links from a do follow blog automatically increases your site visibility in search engines and also your page rank. You can comment on hundreds of blogs on the internet but only a few of them are really do follow. How do you find do follow blogs or sites that are related to your niche? nice and effective post about SEO backlink. thanks a lot for making this brilliant marketing article. waoo! such an informative content about dofollow backlinks and blog marketing tips. I really like the way it’s presented in clear writing. moz bar tool is very good tool check for your no follow, do follow links. thanx for sharing such detailed information on SEO link building. thanks for narrating this step by step guide on blog commenting. I am fully aware about blog comments and niche blogging. This is really a great SEO tip. Thanks for your help and tutorials. This was very helpful to me. I will follow these ways to find quality commentluv blogs. Great SEO tips for modern-day blogging. Great article! it’s very helpful to find dofollow links, it really helps to find quality links at SEO point of view thank you for the awesome work. explained each step of SEO. Really it will help me in creating high-quality backlink and it has been easy for me to rank my websites Nice Post! Thanks for sharing this awesome SEO tips with us. Have a nice day. Thanks for sharing this SEO strategies with us. It was very helpful for me to build a few do follow links for my website. This is the best tech ideas for SEO and marketing. So your tips are constructive and highly beneficial. They’ll help me make good backlinks for all my websites. Thanks for sharing these modern SEO strategies with us. It was very helpful for me to build a few dofollow links for my website and blogs. Great article. Hope this insightful content help my website SEO strategies on getting dofollow backlinks, comment backlinks, natural domain authority.Thanks to the author for sharing this with us.